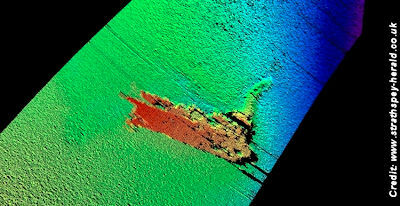 A new underwater sonar-imaging investigation into Loch Ness has uncovered the remains of a monster. Led by Kongsberg Maritime and supported by The Loch Ness Project and VisitScotland, the mission using Munin, a state-of-the-art intelligent marine robot, has revealed new information about the elusive 230 metres deep loch, uncovering areas underwater that have never been reached before. Within the findings, 180m down on the loch bed, Operation Groundtruth has uncovered a recognisable creature. However, although it is the shape of Nessie – it is not the remains of the monster that has mystified the world for 80 years but more one that has inhabited the loch for over half that time and is a star of the silver screen.